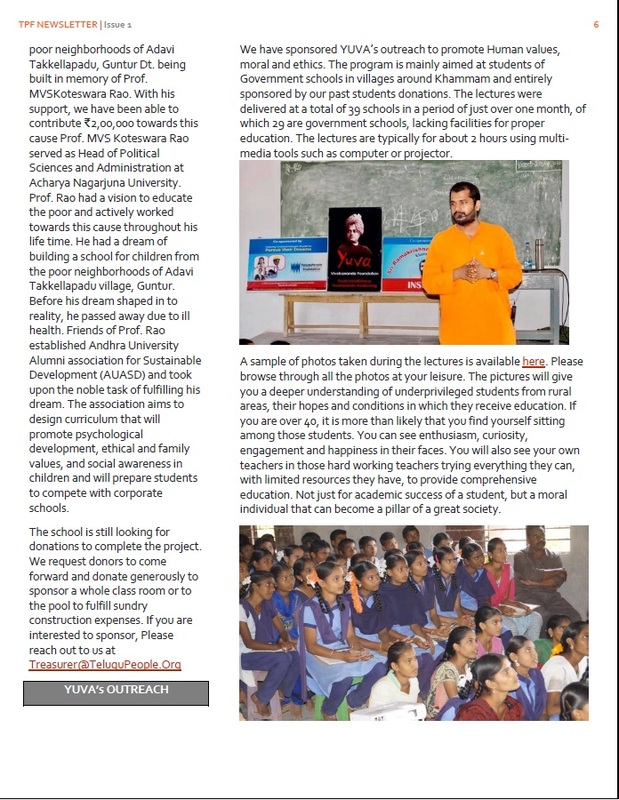 Helping Underprivileged Students Pursue their Dreams. 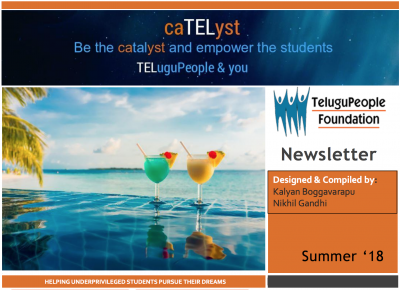 What better day to e-publish our very first Newsletter than Sankranti? 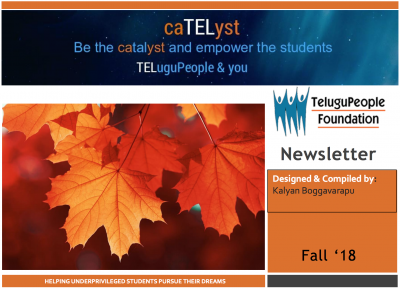 First of all, thank you very much to all of the volunteers, donors, social workers, executive committee, office bearers and board members for your committed and dedicated support to TeluguPeople Foundation! Wish you all a Happy and Peaceful New Year 2017 ! In 2016, we formalized titles for our office bearers. We have now few Directors and Joint Directors! Now we have a qualified CFP as our Financial Adviser to help us grow the Endowment Fund. Another big achievement in 2016 was to revamp our website. We have got CRM and Enterprise Platform licenses for free from Salesforce. We have separate Directors for each of these areas to implement and maintain them. Our goal for 2017 is to be able to help more eligible students. 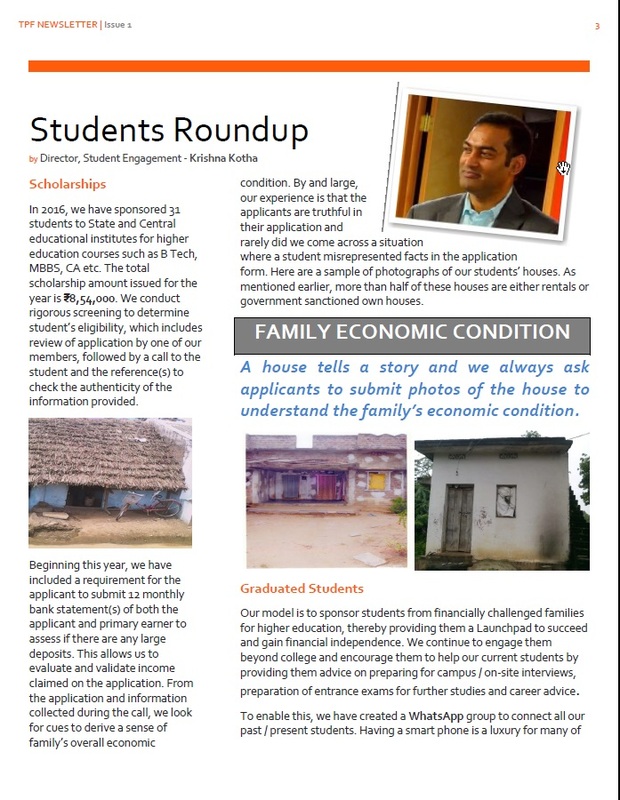 Our aim is to provide life changing opportunities through higher education for more people. 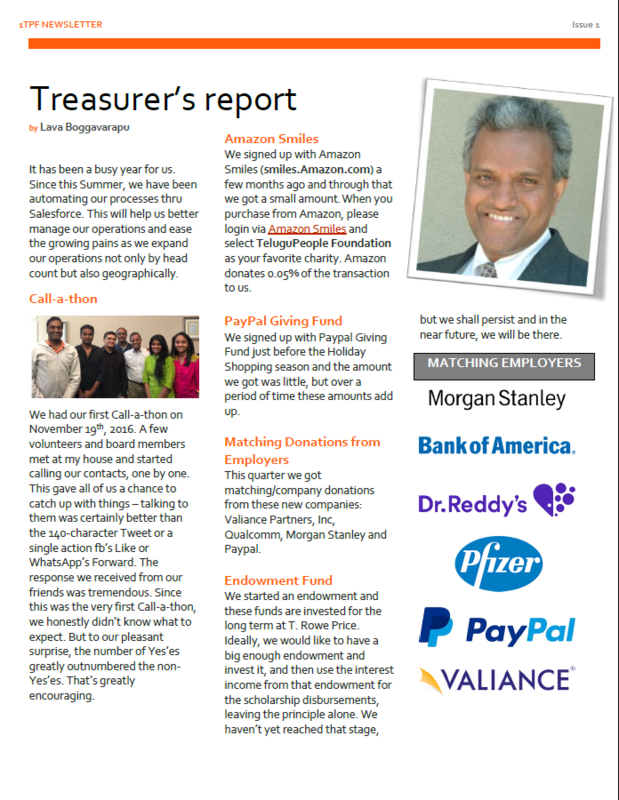 We work towards achieving growth in every aspect and every department in TPF. Our goal is to improve the internal processes so that we can bring in more team members and be able to scale up the operations. There is a lot to be done in 2017 and we are confident of achieving it with your continued participation and support. With your overwhelming support in last year, the foundation is in a position to sponsor at least 20 more students for the year 2017. 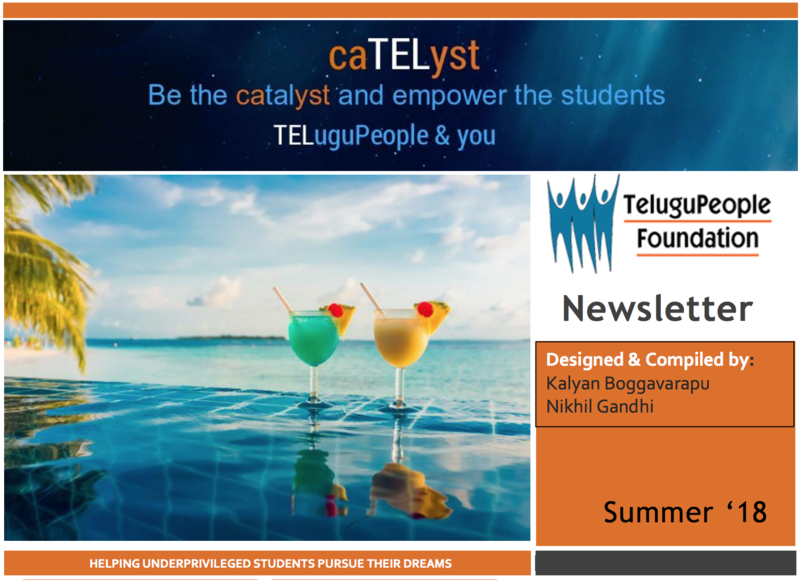 If you come across a deserving candidate, please be sure to refer them to us at students@telugupeople.org . Your referral could change the course of one’s career and life. 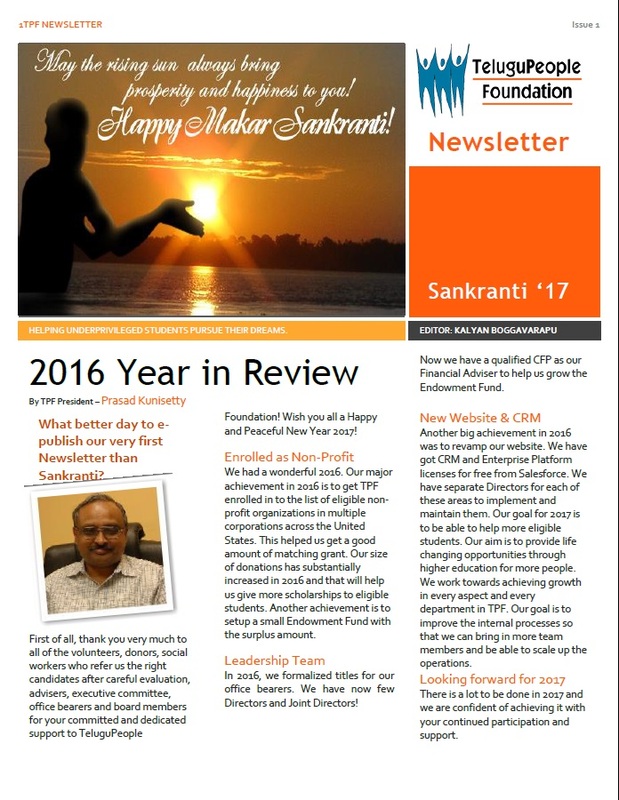 Once again, Happy New Year, Makara Sankranti and Thank you for your support. Our deserv ing students really appreciate your generosity.